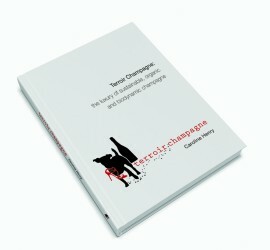 Terroir Champagne: The Luxury of Sustainable, Organic and Biodynamic Cuvees is the first book exclusively dedicated to the true environmentally friendly produced terroir wines of Champagne. 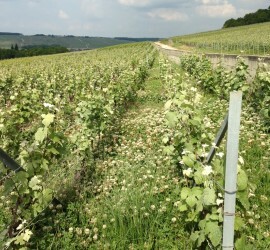 So what is Terroir Champagne? Unlike regular Champagne which aims for standardization, terroir Champagne is all about individuality. These wines express the uniqueness of a place as perceived by the winemaker. The winemaker or the producer is key, as it is he or she who commits to an environmentally friendly way of farming. This is important because to make terroir wine the soil in the vineyard needs to be alive, and this unfortunately is a bit of an anomaly in Champagne, as herbicides are still used on 80% of the surface. A second point is that the yields need to be reasonable as this will allow the grower to pick the fruit when it is ripe rather than the minimum appellation degree. Again this is not the norm in Champagne where appellation limits are generally considered as the absolute minimum. Healthy ripe grapes will make a more balanced and rounder base wine, without too much intervention and additives from the winemaker. The winemaker just provides the framework for the terroir to express itself. However, his personal preferences of vinification, blending, aging and dosage will also add to the uniqueness of the cuvee. Different, unique and individual – terroir champagne is also a real luxury– going back to the original definition of the word. These wines are rare, hand crafted and authentic and they are only about 0.05% of the total champagne production. They are a luxury because of their rarity and they are in demand. Fine wine importers, sommeliers and champagne geeks all over the world have started to realize the real value of these cuvees and have been actively pursuing them. Yet even if they are sought after they are often hard to find for a Champagne outsider. To date there is no reference guide dedicated just to them so Champagne lovers need to weed through generic works in the hope of finding out more about environmentally friendly producers. This is why I feel this book will add a lot of value. In the first part of the book I talk about the viticultural practices in Champagne before I delve into specific environmental practices as well as different certifications. (Viticulture Durable Champagne, Haute Valeur Environmental, AB label, Demeter, Biodivin). In a second part I tell the story of 86 producers, who I believe make terroir wine. In simple language I delve further into the the why and when they decided to work more environmentally friendly. Details about their specific terroirs can be found in the overview of their cuvees. In a last section I give some hints and tips to make the most of your travel in the region a you can discover our terroir products. Eg places to stay, places to eat as well as wine stores or wine bars where one can discover the champagnes of the producers covered in this book. Why did I Self Publish? Real sustainability, organic and biodynamic growing are still a bit of a taboo subject in the Champagne region. Producers who chose to emphasize the life in their soil above their yields are often badly viewed by their neighbors and often presumed to be the cause of all diseases. On the other hand, now that interest in Terroir Champagne is growing, a lot of people are starting to talk about terroir, even if their way of working is not very environmentally friendly. Since the book came out, nothing much has changed even if the CIVC committed to eradicating herbicides by 2025 at the beginning of 2019. However, a practical plan is still being worked out and growers are very reluctant to make changes. Hence, this spring the hillsides soils are just as barren and dead as they were last year and this “commitment’ seems little more than lip service so far.